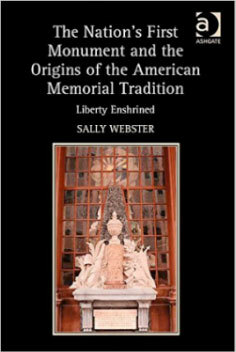 The commemorative tradition in early American art is given sustained consideration for the first time in Sally Webster’s fascinating study of public monuments and the construction of an American patronymic tradition. Until now, no attempt has been made to create a coherent early history of the carved symbolic language of American liberty and independence. Establishing as the basis of her discussion the fledgling nation’s first monument, Jean-Jacques Caffiéri’s Monument to General Richard Montgomery (commissioned in January of 1776), Webster builds on the themes of commemoration and national patrimony, ultimately positing that like its instruments of government, America drew from the Enlightenment and its reverence for the classical past. Webster’s study is grounded in the political and social worlds of New York City, moving chronologically from the 1760s to the 1790s, with a concluding chapter considering the monument, which lies just east of Ground Zero, against the backdrop of 9/11. It is an original contribution to historical scholarship in fields ranging from early American art, sculpture, New York history, and the Revolutionary era. A chapter is devoted to the exceptional role of Benjamin Franklin in the commissioning and design of the monument. Webster’s study provides a new focus on New York City as the 18th-century city in which the European tradition of public commemoration was reconstituted as monuments to liberty’s heroes.